There’s a certain point at which a casual financial discussion shifts to a rambling lecture. I can carry on, making sense to whomever I’m speaking with, and then I’ll come to a topic or point of distinction that makes the listener run away or pass out from boredom. One such matter is the difference between ETFs and mutual funds, and whether that difference matters to you at all. In the right light, these two investment options are one and the same; both are funds that come packed with different securities. While that’s a very defining feature, and often the biggest problem with each type of fund, there are stark differences that influence how a person manages these options and incorporates them into a portfolio. Through descriptions, analogies and examples, let’s see if we can make clear how ETFs and mutual funds are the same and also very, very different. I’ve written plenty about mutual funds in previous posts, so let’s start out with ETFs. Exchange Traded Funds gives us the acronym, and these index-specific funds contain a number of securities. Without getting too far ahead of myself, I will just say the index association is one of the most significant difference between ETFs and mutual funds. While a mutual fund can be all over the place, an ETF sticks with one index, such as the S&P 500 or the Dow. This makes your ETF a sampling of a specific sector, and the value of your fund directly relates to that index. You buy an ETF the same way you would a stock, and the commission fees are usually comparable to stock purchases. You can buy ETFs on the regular exchanges where you’re already doing business, so it’s not a big stretch for someone with an online trading account to dive into this investment world. Since your ETF matches the configuration of one index, these funds don’t see a lot of movement. If the Wilshire 500 drops one company and adds another, your fund will adjust to keep up. Otherwise, there’s not much activity for you to keep track of. For this reason, ETFs fall under the classification of “passive management.” You don’t do much, if anything, between the time you buy and the time you sell. I don’t love the idea of passive management - I think you should always be actively interested and invested in what your money is doing. I do, however, love the idea of letting your money do work while you focus on other means of wealth building. ETFs allow you to capitalize on the stock market’s greatest asset: steady and continued growth. The goal of an ETF is to hang with the rising tide of whichever index you choose. You don’t buy these funds in hopes of beating the market, as you will be routinely disappointed by that effort. In some cases, a market will make quick gains and people make a quick profit off a collection of securities, but that’s not really within the purview of ETFs. Another reason people find the passive management of ETFs alluring is avoiding short-term capital gains and the ugly taxation that comes with them. Capital gains coming from a purchase and sale within 12 months are subject to income tax rates, and those rates can be awfully high. With long-term gains, the current rates don’t exceed 20 percent and can be as low as zero. 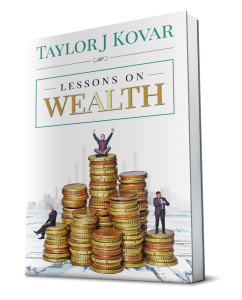 People frequently have investment revenue wiped out by taxes and fees, and understanding the tax rules and service costs of your particular investment makes a big difference as far as what your money is able to do. As with stocks, ETFs allow you to mostly defer on taxes until you sell your position. If you keep an ETF for a few decades, you essentially get a tax shelter in an account that would normally be taxed. At the very least, the money you put into a fund won’t get taken by the government in the early going, which means it gets to do more work on your behalf. You have to pay fees on ETFs that you don’t have to deal with in standard trading. These cover distribution and shareholder fees, totaling a maximum of one percent of your account. One percent might not sound like much, but the difference is noticeable when you can find a fun that only charges you .2 or .3 percent. While these charges are specific to ETFs and feel like money wasted, the cost is drastically lower than what comes with another type of fund (hint: it rhymes with Nutual Nund). You also pay brokerage fees, but paying $7.99 to buy a fund you plan to hold for a quarter of a century is something you should be able to live with. ETFs have tremendous appeal for young investors, and while I don’t agree with all the reasons, I very much understand them. For starters, you usually don’t have to pay a minimum dollar amount for a fund, and instead have to buy one or more shares. When you’re just getting started, it’s comforting to have the option to start small. Funds that match an index also let investors cast a broad investment net. Your holdings will match the performance of a specific index, so you can learn about a general market or sector instead of obsessing over a single company. If you stay up on the latest tech happenings, you might be a Nasdaq ETF kind of person. Other people will want to stick with the Dow for familiarity. Because of how they’re configured, these funds can be fairly limiting. You won’t lose your shirt with an ETF, but there’s a decent chance other investors will outpace you. If you’re in a rush to invest, don’t have a lot of money and know you want in on the markets, ETFs might seem like the easiest and best choice. I don’t think they’re right for everyone, but for some of you, this could be the way to go. In a nutshell, an exchange traded fund will give you a variety of securities, matching the makeup of a specific index. You won’t see a massive return, you won’t get crushed by fees, and there won’t be a lot of movement within your account. This is described as passive management, and that description fits pretty well. Your mutual fund is exactly like an ETF, in that you have a collection of securities in one fund. Thereafter, everything goes off the rails. Mutual funds aren’t beholden to one index - far from it. Some funds target specific markets or industries, others focus on share price, and some seem totally aimless. The investment options are limitless, which is good or bad, depending on whether or not your money is being invested arbitrarily. Diversity has a lot of appeal and the option to bundle stocks, bonds, emerging markets and anything else from any index entices a lot of people. While ETFs provide a passive management strategy, mutual funds are the active management alternative. Whoever manages your fund will be constantly looking to find the highest performing shares while ditching securities that don’t outperform the market. That’s the entire goal of a mutual fund - beat the market. Active management leads to extra buying and selling, which means massive portfolio turnover. This portfolio turnover ratio can be ridiculous; I’m talking upwards of 100 percent ridiculous. If you have 80 stocks in your fund, there could easily be 100 trades done over the course of a year. With a license to manage actively, mutual fund managers usually take advantage of these opportunities. Brokers and managers rarely have trouble finding reasons to pull the trigger on trades. The active management of mutual funds has big tax implications many young investors don’t understand. As noted in the ETF section, long-term capital gains and short-term capital gains are taxed differently. ETFs mostly avoid short-term fees because of limited position movement, but mutual funds are ripe with opportunities to get taxed. For every short-term gain, you could end up paying upwards of 30 percent in taxes. In theory, your account grows at a quicker clip than a fund that’s passively managed, but the IRS gets to claim a substantial amount of that money. Some mutual funds are offered through tax-sheltered accounts. This allows investors to avoid hefty taxes, though other fees will still be around to do battle with your earnings. There’s also something a little counterintuitive about having an active management fund in a retirement account that can’t be touched until your almost 60. There’s one big, obvious fee mutual funds present that ETFs don’t, and that’s the load fee. This is a percentage investors pay upon opening or closing their account. The fee limit is three percent, and the amount and payment time will depend on the particular fund and provider. Some accounts split the load fee between the front and back end, with one percent at purchase and one percent at sale. In some cases, the closing fee will be waived for investors who keep a mutual fund for a certain number of years. The load fee isn’t fun, but at least it’s apparent. More money can be lost through less obvious channels, which is one of the major beefs I have with mutual funds. These accounts come with an expense ratio, which includes all sorts of costs ranging from custodial services to legal fees. On top of those, you have to pay the service costs racked up by the account manager, and those can really add up; active management usually means the fees are active as well. Nothing beats a mutual fund when it comes to diversification. Hang on, let me say that differently: no account over diversifies as much as a mutual fund. Diversity is a cornerstone of sound investing, as it keeps you from having all your eggs in one basket. No matter what your investment level, you should try to spread your money around strategically. If you don’t know much about the different exchanges, having a diversified portfolio helps you avoid some of the inherent volatility. Mutual funds provide this type of security. At the same time, extreme diversity can negate solid earnings. If your money is spread too far and wide, you can expect to own your fair share of bad stocks, and those will drag your portfolio down even as other companies perform admirably. It’s a bit ironic that the goal of mutual funds is to outperform the market, and yet outlandish diversifying often causes these accounts to underperform. Diversification is good. Diversification for the sake of diversifying is not so good. Everyone wants to beat the market. Beating the market is what turns investors into rich people. So why would anyone go with ETFs, which don’t even try to outpace the market, instead of a fund that’s designed to win? With the exception of mutual fund managers, most financial advisors are quick to point out that mutual funds typically underperform. These accounts are frequently presented wihtout all the details regarding taxes and fees, and that naturally makes them look more appealing. Once a manager starts making frequent moves and filling your portfolio with too many securities, all the glitzy stats you saw before buying the fund start to fade away. ETFs don’t present the same problems as mutual funds, though they make up for it with a variety of other issues. The tax benefits are reasonable and the fees aren’t disastrous, but you don’t have much versatility with an ETF. You can buy and sell at your pleasure, which is nice, but you’ll probably have a tough time maximizing your earning potential. It can be hard to choose where to invest your money. I’m not surprised people tend toward ETFs and mutual funds, as there’s built-in diversification and lots of brokers advise people start with one of these options. Fortunately, investors get to form and reform their strategies as they go. If your jumping-off point is mutual funds, that’s where you start. Maybe you have an awesome manager who doesn’t charge fees and brings in massive returns; if that’s the case, leave your money right where it is. My main concern is that you don’t invest without understanding what you’re investing in. With both ETFs and mutual funds, people often buy in without learning first. When you know the differences, you’ll have a better understanding of why your mutual fund brings in less money than your cousin’s ETF, or why your ETF gets outperformed by your sister’s Samsung stock. Both these options cater to people who might not understand the markets particularly well, or who just don’t have time to do a lot of investment research. While everyone, regardless of experience, should be investing in their future, you have to know that funds targeting novices are more likely to take advantage of people. Brokers and fund managers don’t always prioritize rookie investors, but they will still make sure to maximize the fees young clients have to pay. That’s how the game works, so it’s up to you to learn as many of the rules as possible. This is a brief description of ETFs and mutual funds, and I encourage you to do more research or ask your advisor for their thoughts. Clearly, I’m not in love with either option, and I’m mostly opposed to mutual fund investing. You will likely hear differing opinions, and that’s fine. As long as you’re educating yourself as you put your money to work, you’re on the right track.